Given the summer, painting and writing up match reports have taken a bit of a back seat to sitting in the garden and drinking imported session IPA whilst grilling chunks of chicken on the bbq. 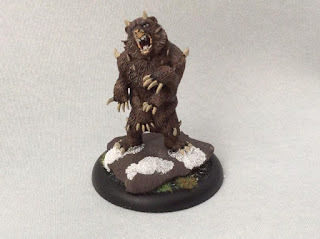 However, in the midst of all of this excitement, a Malifaux monster, in the shape of the Slate Ridge Mauler has taken to the tabletop. Mounted on a 50mm round base and pinned to a chip of actual slate (which was surprisingly easy to drill) he and his 4 arms are ready to appear sporadically when I next get in a game and want to try out what is often regarded as an under powered but potentially situationally useful model. That's all well and good but when are you going to do a batrep on Horizon Wars?